NORTH BAY, Ont. 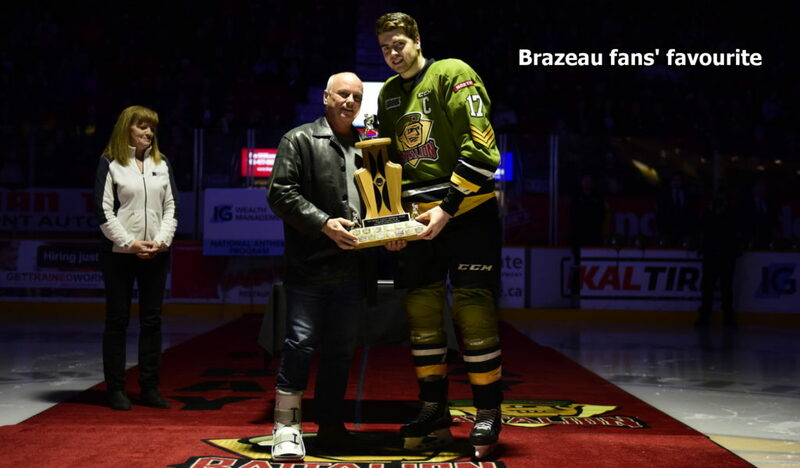 — Justin Brazeau took centre stage Sunday when the North Bay Battalion announced its individual award winners for the 2018-19 Ontario Hockey League season, capturing three honours. Brazeau, who was named most outstanding player, won voting for the Don (Hockey) Hadley Memorial Award as the fans’ favourite player and was selected as the overage player of the year. Right winger Brazeau, a resident of New Liskeard, Ont., turned 21 on Feb. 2. He was a 13th-round choice of the Battalion in the 2014 OHL Priority Selection. Hadley, a veteran of the Second World War, was a longtime season ticket holder in Brampton, where the Battalion played its first 15 seasons. Brazeau won the award for a third straight season and was recognized as the most outstanding player for a second consecutive season. Nick King was named the Troops’ defenceman of the year. The native of Kitchener, a 10th-round pick in the 2015 OHL Priority Selection by the Owen Sound Attack, turned 20 on Jan. 13. Left winger Harrison Caines was named rookie of the year. A ninth-round pick by the Battalion in 2017, the Stouffville, Ont., resident turned 18 on Feb. 14. Centre Matthew Struthers was selected as the most sportsmanlike player for a second straight season. The Milton, Ont., resident, who turned 19 on Dec. 26, was a third-round selection by Owen Sound in 2015. Pacey Schlueting, who has played defence and left wing, won the Judy Smith Award as the scholastic player of the year. The North Bay native, who turned 17 on Jan. 2, was the Troops’ first-round choice in the 2018 OHL Priority Selection. Smith formerly was the scholastic adviser to Battalion players at Chippewa Secondary School. Luke Moncada, a centre and left winger, took the Jerry Callaghan Memorial Award as humanitarian of the year. A Toronto resident, he was a third-round pick by the Guelph Storm in 2016. Callaghan served with the Battalion in a variety of capacities when it was based in Brampton. Award winners were recognized before the Battalion’s final regular-season game, against the Niagara IceDogs.